PlusSeal is a complete line of Tapes & Adhesives designed for single-ply roofing. The PlusSeal Adhesive products feature a three-in-one Bonding Adhesive along with other ancillary items to complete any EPDM project. The PlusSeal Tape products feature EPDM Seam Tape, Cover Strip and Flashing Tape. The PlusSeal Solvent Based Bond Adhesive is a general purpose synthetic rubber adhesive for brush or roll applications. The PlusSeal Adhesive has a long tack time and is resistant to aging, heat, cold and water. 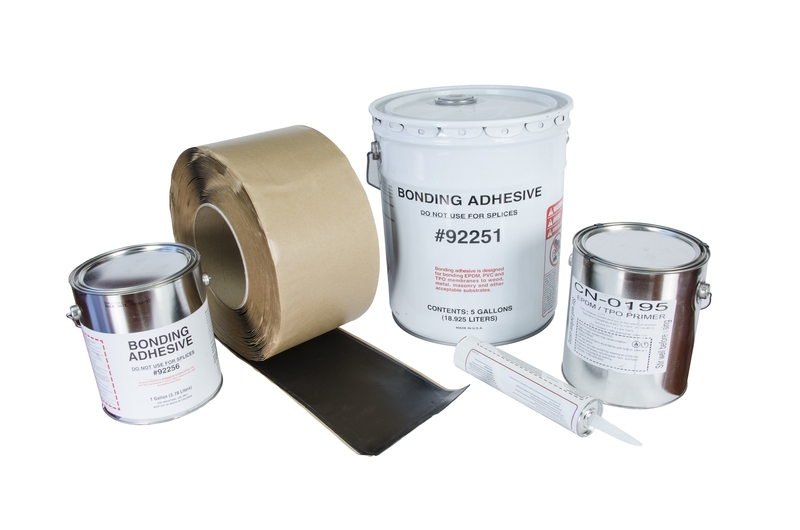 The Solvent Based bonding is a three-in-one adhesive suitable for EPDM, PVC and TPO applications. The adhesive is available in 1 and 5-gallon pails. The PlusSeal Black Lap Sealant is a black polymeric sealant specifically designed for weather ability and adhesion to EPDM roofing membranes. The primary use of PlusSeal Water Cut-Off Mastic is as a water-block mastic in applications such as termination bars, reglets and drain clamping rings. It can also be used as a general purpose waterproofing sealant. The PlusSeal Water-Based Bonding adhesive is a unique synthetic bonding adhesive specially formulated to replace comparable solvent based adhesive for commercial roofing. The adhesive is designed for bonding EPDM, PVC and TPO membranes to substrates. The adhesive is available in a 5-gallon pail. The PlusSeal Splice adhesive is a high strength, solvent based contact cement for bonding EPDM membrane splices. Splice adhesive has a high degree of tack and excellent resistance to moisture and temperature extremes. The PlusSeal EPDM Seam Tape is an extruded, black, pressure sensitive, rubber adhesive backed tape designed to provide a high strength, watertight seam for single ply EPDM roofing membranes. The PlusSeal EPDM Cover Strip tape is designed to cover and protect membrane fasteners, membrane repairs and seam overlays in all EPDM roofing systems. The PlusSeal EPDM Flashing tape is designed for flashing rooftop penetrations such as corners, pipes and general purpose flashings.